If you haven’t yet visited Fantasy Faire 2016 you have through tomorrow to do so. As I said in my first post, this event is enormous. It’s comprised of 14 sims. I showed you four in the last post. Today I am going to show you another five, and I will finish them off with another five tomorrow. Echtra, sponsored by The Lost Unicorn Gallery, is dark, mysterious and just gorgeous. Look at the materials work in this picture. They were just stunning, and I knew I had to capture that. Please note that while there IS rain on the sim, it didn’t photograph well for me on any of the WL settings I wanted. 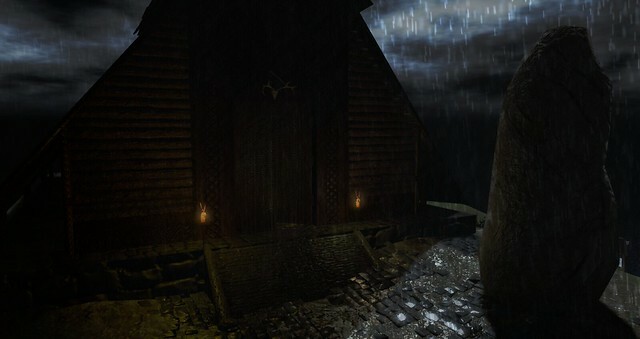 So I added the rain you see below as an after effect. Here you’ll find a complete list of the stores located on Echtra. Next on the tour is The Golden Delta. 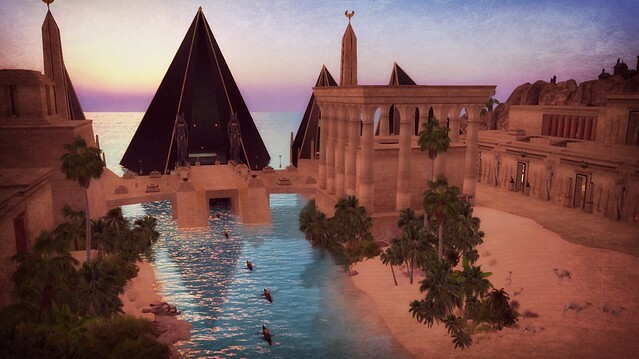 Sponsored by Fallen Gods Inc. this desert sim conjures up images of Ancient Egypt. I particularly fell in love with the water (I am a bit obsessed with Linden water, I must admit… probably from years of sky dwelling). When I visited The Golden Delta, I couldn’t help but think of how critical water is in a desert climate, how life and civilizations spring up around those precious resources. Check out the list of stores featured on this stunning sim here. I probably ought to have posted Fairelands Junction in my first blog about the event. But to be honest, I wasn’t happy with the pictures I’d taken, so I wanted to go back and reshoot. I finally found one I liked. I wanted to show off the portals to the sims, because I love how through each portal you see a glimpse of what that sim looks like. 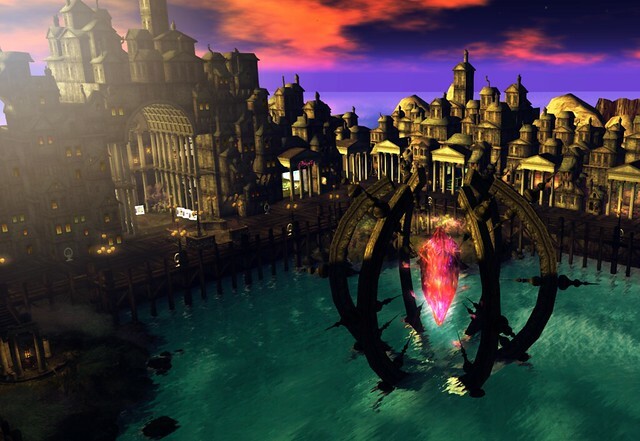 While you can teleport directly to any of the sims, I highly recommend a visit to the Fairelands Junction, just because it’s such a unique gateway to the entire event. This critical sim was sponsored by Roawenwood, and you can read more about it here. Lucentia, with its stunning, gigantic crystal was one of my favorite places. Maybe it just made me think of my own name. 😛 But for whatever reason, I loved the drama of this sim, which is sponsored by The Looking Glass. Here’s the list of stores you’ll find located on Lucentia. Malfience is the sim at the heart of The Fairelands Quest. This is an interactive quest for Fairelands visitors, and you can learn more about it here and here. I found this sweet old woman in her cottage, and we had a lovely chat about life before Belfience became Malfience over tea (okay, not really but I’m pretending here). I’d encourage you to hurry over to do this quest. Maybe you can help this kind woman! That’s all for now! I’ll post pics of the final five sims in the event tomorrow (or possibly later tonight)! Fantasy Faire 2016 is open and runs through May 5th. This event supports Relay For Life, which if you’re not familiar helps to raise money for cancer research. But it’s also a celebration of those who’ve been through cancer and lived to share their stories and a time to remember those whose battles could not be won with our still far too limited treatment options. Fantasy Faire features so many fabulous designers, with products for sale to help raise funds, and those creators have, as usual, outdone themselves with both their talent and generosity in giving to this great cause. But the stars of Fantasy Faire each year are the amazing builds. This year there are fourteen sims in total. FOURTEEN. It’s crazy! 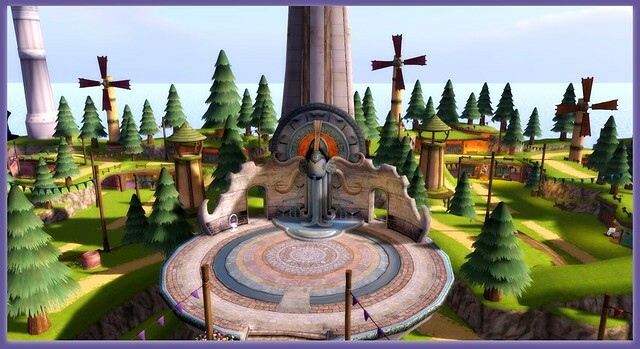 There are ten shopping sims, an entertainment sim, a literary sim, a sim that commemorates and celebrates those lost and, of course, The Fairelands Junction, which is your portal to all of the other sims. I took pics on all sims, and my goal is to share all fourteen pics with you. I have four to share right now. First, sponsored by Arcadia, is Blackmoor. Blackmoor is dramatic and darkly mysterious and beautiful. I’ll be blogging a bit more of what I’m wearing in a future post, but my rain boots and umbrella are both Decoy and available at The Epiphany, as is the dress from Luas. 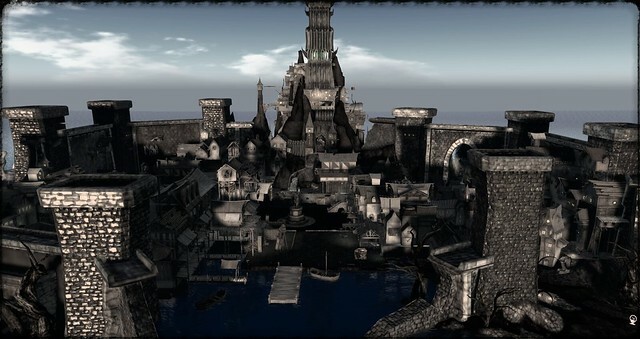 If you click here to go to the official Fantasy Faire blog, you can see a completely list of stores you’ll find on Blackmoor. Breeze, sponsored by Solarium, is colorful and really, really cute. It has a feel of being something out of a children’s book (at least to me). Here’s a link to the list of stores to be found on Breeze. 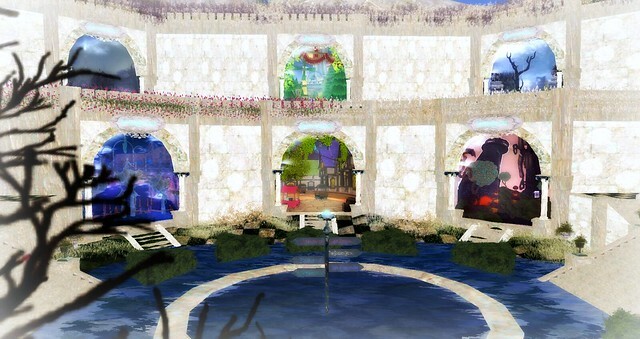 Sponsored by KittyCatS, I think Bright Haven is the sim where I’d most like to live! The cheerful, bright little cottages and the beautiful waterfront just makes it so quaint and charming. Here you’ll find the list of stores located on Bright Haven. And finally, for today, Dangarnon. Sponsored by Death Row Designs, this darkly beautiful sim speaks (to me) of a bygone era. Click here for a complete list of stores on Dangarnon. For all of the information you’ll need to navigate this large event, I highly recommend going through the official Fantasy Faire website. And if you’re not into fantasy, but still want to help the cause, you will find plenty of donation kiosks throughout the sims to do just that! Happy Friday! I have a couple of Fifty Linden Friday releases to show you. It’s also the final couple of hours for Fashion For Life, so do be sure you check it out before it ends at 11:59 pm SLT tonight! The adorable bench I am sitting on is from Sway’s, as is the knot artwork. These items are both available for L$50 for FLF today, so go grab them! Also for FLF, from fri.day, are my cute heels. The artwork and this gorgeous lingerie set from Blacklace inspired this photo… the concept of “tying the knot.” The candles from Collage for We ❤ Role-Play helped to set the perfect mood. My gorgeous skin is Evie by Lumae for The Cart Sale. This beautiful skin can be yours for just L$10! Fashion For Life is winding down, and the event has already raised a tremendous amount of money for the American Cancer Society. You can check the current amount that’s been raised right here. For this post, I’m featuring the gorgeous Shae gown from Miamai. Miamai is located on the Wander sim at Fashion For Life, which runs through June 21st. This is a 75% donation item, and it’s really stunning. I love how unique it is, and how detailed. The beautiful prop pose is from Infiniti’s gacha for the Tales Of Fantasy event, which runs through June 30th. My skin is Livy from Glam Affair for The Arcade. I’ve added some mascara tears to it, but don’t worry…I plan to show you a better look at this gorgeous face soon. The house I’m standing on is incredible, and I plan to show more pics of it in a coming post (I’m still decorating!). It’s Scarlet Creative’s offering for the current round of Collabor88, and here is the truly amazing, remarkable part… it’s just L$88. No, for real. I know, right? Incredible deal, definitely one not to miss. Though what I’m standing on is far more like a pergola, it made me think of a widow’s walk, and the rest of the picture was inspired from there… the dress has this old-fashioned feel I love, and the pose is one that, to me, captures both sorrow and also acceptance, in a truly beautiful and unique way. There are so many events happening right now… some of our regular faves, like Collabor88. And then there’s Fashion For Life, which is a massive, amazing event that raises money for the American Cancer Society. I’ve written before about why fundraisers like FFL and RFL are meaningful for me, so I won’t go into that again. But suffice it to say, I think the good these events do is amazing and impressive. And I love the theme of Wanderlust for this year. You can read more about the event here, and there is a complete list of slurls on this page, too. There are a lot of sims for this event, which means lots of opportunities to shop and help raise money for a great cause! I’m wearing the new Summer II from Glam Affair, which can be found at the new round of Collabor88. I fell hard for Glam Affair’s Summer last year, so I was happy to see another take on this beautiful skin. My adorable sun dress is from SySy’s for Fashion For Life, as is the playful suitcase pose/prop by NanTra. These strappy sandals are SLink add ons from fri.day, also at Collabor88. My bracelet by Theosophy, the chairs on my deck, and the bookcase you can see a glimpse of inside are also all items from Collab. The chairs are by Trompe Loeil, the bookcase is from Schadenfreude. Here’s a close up, to show you both the gorgeous Glam Affair skin and also the Cae jewels for Serafilms Gone With The Wind round, which opens today (June 12th)! I’m also debuting my new shape here. I’ve been tweaking my face for a few days, and I like the end result. I’m sure most people won’t see a huge difference, but to me it’s a fairly dramatic change, lol. More soon… I’m getting back into the swing of things after traveling and dealing with a flare up.